12 reports of incidents with SR Suntour Suspension forks failing has led to a recall of about 17,000 GT, Giant and Trek Bicycles with SR Suntour Suspension Forks. According to reports, the internal support tubes within the fork can fail. By "fail" this means that the suspension fork did not do what it was supposed to do and absorb force upon impact. A typical scenario would be the fork failing when a rider lands a jump. The result of this fail is the rider loses control and get injured when hitting the ground. Keating Law Offices secured a six-figure settlement in 2011 for a rider who was injured in this exact fashion when the fork on the rider's mountain bike failed upon landing a jump. While that suspension fork was manufactured and distributed by a different company, the facts are the same and the products were very similar. That case is also the same from a legal perspective. Illinois has "strict liability" product laws. While there are some exceptions, generally speaking a rider who is injured when a bike or bike component fails need only show that the product failed "when put to a reasonably foreseeable use." Attorney Mike Keating has also successfully litigated a case against SR Suntour over an allegedly defective sprocket set. 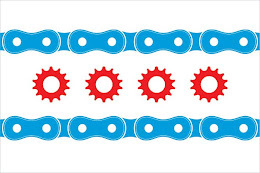 If you have any questions regarding this post or an issue involving Illinois product liability law, please contact Illinois Bicycle Attorney Mike Keating at 312-208-7702 or MKeating@KeatingLegal.com 24 hours a day, 7 days a week. All e-mails and phone calls are returned promptly. All initial consultations are confidential and free.